Renting a Car for your holiday gives you the flexibility to explore the area at your own pace. Short-term Car Rental can be useful close to home - either while your own vehicle is repaired, or for occasional use as part of a car share scheme. 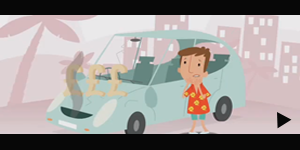 Whatever your reasons for hiring a car - make sure you're not left with the bill if the vehicle is damaged or stolen whilst in your care. Cover the Rental Company's charges through Worldwide Travel Insurance! If your holiday rental car is damaged or stolen, you are usually liable to pay an Excess, or Collision Damage charge. Even if the damage was not your fault, you will be charged. Why pay your Rental firm's costly Collision Damage Waiver? Collision Damage Waiver is offered by most Car Rental companies, enabling you to remove or reduce the amount charged for damage to the car. However, as well as being costly, this add-on often does not cover all costs, particularly relating to tyres, windows and underbody. Our car hire excess insurance acts in place of CDW, at a much lower price. View frequently asked Questions <Can I hire in my Home Country? Who can buy this Insurance? Are there any Age Limits? Where can the vehicle be driven? What types of vehicles can be insured? What vehicles cannot be insured? Do I really need this type of Insurance? The Lead Driver, plus any additional drivers named on the Rental agreement. Annual policies can cover up to 4 family members living at the address shown on the policy certificate, enabling any to be the Lead Driver on a rental; only one vehicle can be hired at a time. Drivers must be aged between 21 and 84yrs and named on the Rental Agreement. You are covered when driving on any Public Highway, i.e. any road made or unmade that is intended for use by the general public. The only exception is when travelling to/from accommodation that is only accessible by unmade road and, in these circumstances, due care and attention must be exercised to minimise risk of any damage to the rental vehicle. Rental cars carrying up to 9 people. Yes, if you return the vehicle damaged, even if it was not your fault, you will be held liable for the charge set by the rental company. This insurance enables you to claim back the charges including up to £50 for admin fees. There are also other benefits such as mis-fuelling cover. Watch our TV ad now! Renting a car while overseas gives you tremendous freedom to explore your destination. But it can be expensive, especially when car rental excess insurance is factored in. Some customers are only offered a collision damage waiver when they collect their car – an often expensive fee that can further stretch the budget. There’s no denying that a collision damage waiver can give you extra peace of mind – especially on unfamiliar roads overseas – but car rental companies often charge a hefty fee for this important add-on. Car Hire Excess Insurance from Worldwide Insure gives you all the protection you need in the event of a collision – but for a much lower price. Many holiday makers are becoming wise to the high fees charged by car rental firms for excess cover, which is why buying separate car hire excess cover has become so popular. Get a quote for low-cost car hire excess insurance above. Full details can be found on the FCA's Register by visiting http://www.fca.org.uk/register or call the FCA on +44 20 7066 1000.